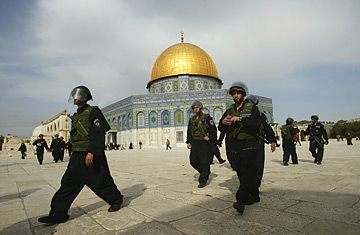 Israeli troops walk past the Dome of the Rock at the al-Aqsa mosque compound in Jerusalem, February 9, 2007. Angry Muslim worshippers scuffled with police Friday over contentious Israeli renovation work at a disputed holy site in Old City. The latest crisis began when Israeli authorities started rebuilding and extending a pedestrian ramp which rises to the Mugrabi Gate, an entrance that allows tourists to view the gardens of the sacred Muslim precinct, the silver al-Aqsa mosque and the Dome of the Rock, a shrine clad with turquoise mosaics and topped with a glowing, golden dome. The ramp is a simple piece of construction that will rest on seven concrete pillars. A 2004 earthquake and a snowstorm had damaged the old pedestrian bridge. But with tension running high between Israelis and Palestinians, the repair work has become a volatile religious issue, one that radical Muslim clerics are using to whip up more hatred against Israel. Says Dan Seidemann, a Jerusalem lawyer trying to broker a solution to the latest religious flare-up, "It's reaching critical mass and the situation could explode at any time." Neither Muslims nor Jews are comfortable sharing this holy site, and religious extremists are trying through bombs, fire, stones and other provocations to drive the other out. Some Muslim clerics say that re-building the pedestrian walkway is tipping the balance of co-existence between the two faiths. As an editorialist wrote wearily in the Israeli daily Ha'aretz: "The excavation work and bridge construction...have turned into the Battle of Armageddon, as happens every time." In 1996, tunneling by Israeli archeologists underneath the compound led to riots between protesters and Israeli troops in which 69 Palestinians and 16 Israeli soldiers were killed. The Mugrabi Gate has always been a thorn in the side of the al-Aqsa worshippers. It provides the only Israeli access to the Muslim mosque and shrine, and it was through this gate in 2000 that Ariel Sharon, then the Israeli opposition leader, strutted into the Muslim grounds and sparked a bloody Palestinian uprising. It is also via this pedestrian ramp that Israeli police swarm into the Muslim precinct whenever trouble erupts  as they did during Friday's riots  and Muslim leaders are worried that the new, reinforced ramp will allow more police and extremists to trespass on their holy shrine. Some Christians and Jews believe that the building of the Third Temple by the Jews will herald the Messiah's arrival, and that can only be accomplished by destroying the Muslim place of worship. But Israeli authorities insist they are making the ramp stronger only to make it safer for thousands of daily visitors. In Mecca, Palestinian leaders from the rival Fatah and Hamas movements took a break from their efforts to avert a civil war and condemned Israel's supposed tampering with the holy place in Jerusalem. Hamas spokesman Ghazi Hamad said: "Israel has a clear scheme to demolish the al-Aqsa mosque through various games and tricks, and we hope to see a decisive Arab and Islamic position. The language of condemnation is not enough." Also in Mecca, Palestinian President Mahmoud Abbas warned that further excavation could endanger a November cease-fire in Gaza between Palestinian militants and Israelis. The crisis will also complicate Abbas' task of persuading Hamas to moderate its hostility towards Israel, which it refuses to recognize. Meanwhile, in Iran, spiritual leader Ali Khamenei warned: "We must make the Zionists regret their action." All this hostility could have been avoided, say Israeli experts, if the authorities had first sought clearance from the Waqf, the Islamic board which governs the al-Aqsa mosque. Israeli Prime Minister Ehud Olmert is under pressure from his neighbor, Jordan's King Abdullah, and from his own defense minister Amir Peretz, to halt the controversial dig. So far, Olmert has refused their entreaties, saying that the changes would not " harm" anyone. Meir Ben-Dov, a leading Israeli archeologist who has worked on the site for 39 years, criticized the excavation work. He told the Israeli press that it was " short-sightedness by someone who wants riots, by people with no brain." Already, one Palestinian militant group says it intends to attack synagogues in revenge for the excavations. The standoff at Temple Mount/al-Aqsa, over a simple repair, threatens to blow into something far larger and more dangerous.